The blue shield is mounted by the symbols of papal dignity, the same as those used by his Predecessor Benedict XVI (the mitre above crossed keys of gold and silver, bound by the red cord). 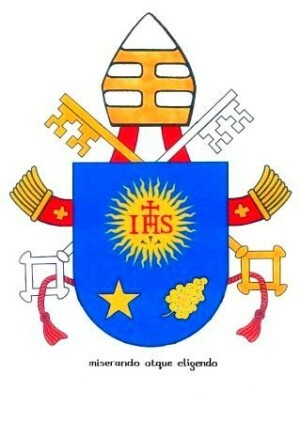 At the top of the shield is the emblem of Pope's religious order, the Society of Jesus: a radiant sun carrying the letters in red, IHS, the monogram of Christ. The letter H is crowned by a cross; beneath the letters are three black nails. Lower down on the shield you find a star and a bunch of grapes. The star, according to ancient heraldic tradition, symbolizes the Virgin Mary, the Mother of Christ and of the Church; while the bunch of grapes indicates St Joseph, the patron of the universal Church. In traditional Hispanic iconography, St Joseph is shown with a vine in hand. By setting such images on his shield, the Pope expresses his special devotion to the Most Holy Virgin and to St Joseph. This homily is a tribute to Divine Mercy and is read during the Liturgy of the Hours on the feast of St Matthew. This has particular significance in the life and spirituality of the Pope. In fact, on the Feast of St Matthew in 1953, the young Jorge Bergoglio experienced, at the age of 17, in a very special way, the loving presence of God in his life. Following confession, he felt his heart touched and he sensed the descent of the Mercy of God, who with a gaze of tender love, called him to religious life, in the example of St Ignatius of Loyola. Once appointed Bishop, S.E. Mons. Bergoglio, in memory of this event that symbolized the beginning of his total consecration to God in His Church, chose, as a motto and as a programme of life, the expression of St Bede miserando atque eligendo, which he also intends to keep also in his papal coat of arms.